Habersham towns and cities are seven in number. Alto, Baldwin, Clarkesville, Cornelia, Demorest, Mt. Airy and Tallulah Falls. Additional communities, not formally organized with a local government, are also home to Habersham’s history – Batesville, Turnerville, Hollywood and other small enclaves of early residents. 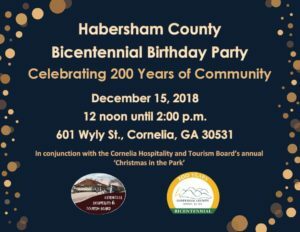 Officially, our county was born on Dec. 15, 1815, but the beautiful hills of Habersham have welcomed newcomers to Northeast Georgia for hundreds of years. During the late seventeenth century, Native American Cherokee, migrated to what is today Northeast Georgia from the north, establishing towns along the swift-flowing mountain streams and rivers with names like Soque (also spelled “Soquee”), Nacoochee, and Tugaloo. The Lower Cherokee Tribe made two major land cessions to the State of Georgia in 1817 and 1818, which opened the northeast corner of the state to white settlement. Habersham County was chartered by the Georgia Legislature on December 15, 1818 and named after one of Savannah’s most well-known citizens Joseph Habersham. Col. Habersham was a Revolutionary War veteran and served as the U.S. Postmaster General for six years, under Presidents Washington, Adams and Jefferson. Originally Habersham County included most of what is today White and Stephens, along with parts of modern-day Lumpkin, Rabun and Banks Counties. For many years the area was the edge of Georgia’s northern frontier. Most land was acquired by settlers through headright grants given Revolutionary War veterans and widows for service during the war. Families like Dillard, Wofford, Sutton, Allen and many others made the newly opened hill country home. Clarkesville was one of the first Northeast Georgia towns to attract seasonal visitors. By the 1830’s summer tourist came from the coastal plains trying to escape the heat of South Georgia. Hotels and boarding houses began springing up in and around new county seat, including the stately Mountain View Hotel, said to be one the finest hotels north of Augusta. Many wealthy southern planters decided to be more permanent seasonal residents and built spectacular summer homes with names like Annandale, Gloaming Cottage, and Blythwood. In 1857 the Georgia Legislature created White County from the western part of Habersham County and named it in honor of David White, the Georgia politician from Newton County who helped establish the new county. The county seat was named after General Benjamin Cleveland, a local resident, and veteran of the War of 1812. The county courthouse, completed in 1863 and designed to resemble Independence Hall in Philadelphia, was built on the city square and paid for in Confederate funds. Fortunately, it still stands today and houses a museum. Most of the area was untouched by the physical ravages of the Civil War, but like the rest of the South, the aftereffects of the War Between the States were devastating. Recovery for the region started with the introduction of the railroad. At the close of the Civil War Georgia started the reconstruction and modernization of the many miles of railroad destroyed by the conflict. Northeast Georgia, however, was the one area of the state that had never seen a railroad. During the early 1870’s the Atlanta & Richmond Air-line Railway was completed. (It was later reorganized as the Atlanta & Charlotte Air-line Railway and became known as the Southern Crescent.) A portion of the new railroad ran through the southern edge of Habersham County and played an important role in its future. A group of investors saw the need to expand a railroad deep into the Northeast Georgia Mountains to the majestic Tallulah Falls and Gorge. In the 1882 Northeast Railroad was completed; bringing hundreds of tourist and sightseers to Habersham County. Since the late 19th century roads were still primitive, the new railroad was a major reason for the boom in growth during the 1890’s. After facing financial difficulties, the railroad was reorganized and named the Tallulah Falls Railroad in 1897. In the early 1880s, surveyor R. A. Reynolds helped design the town of Cornelia at the junction of the Charlotte Airline Railroad and what would become known as the Tallulah Falls Railroad. The junction of the two railroads had several names, including Blaine and Rabun Gap Junction, before it was finally chartered on October 22, 1887 as Cornelia. Middleton P. Barrow, a Civil War veteran and former US senator from Georgia, was the Athens attorney who helped incorporate the new town and named the town in honor of his wife, Cornelia. Demorest is one of the most unique towns in Northeast Georgia. Just four miles north of Cornelia, it was among the first prohibitionist towns in the nation. It was incorporated on November 13, 1889 and named after the famous New York City publisher and prohibition advocate William Jennings Demorest. Originally all property deeds in Demorest required all residents to refrain from the sale or use of alcohol as a beverage. Founded as the J.S. Green Institute in 1897, today’s Piedmont College in Demorest, is one leading private liberal arts colleges in Northeast Georgia. The same natural beauty and moderate climate that attracted Habersham County’s earliest residents still welcomes newcomers today.